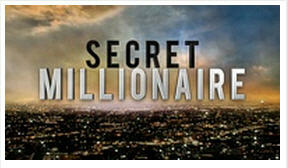 I watched a TV show called Secret Millionaire last evening. I'd never seen it before but I was intrigued by the previews. Each week a person or family with much money leaves their mansion and goes undercover into an impoverished area to see what it's like to live in these conditions. During this time, they're given limited funds and a place to live in the neighborhoods they are exploring. After a period of time, they reveal themselves and give money to some of the people or charities that touched their heart. It touched my heart as I watched the homeless up close, a woman who runs a home for women and children who are escaping domestic violence situations, a young man who puts together toiletries to hand out to the homeless on Skid Row. How easy it is to live and never see the faces of those who are truly struggling. To realize that $3 a day for food is not much and very difficult to purchase anything that is nutritious and healthy. "I know what it is to be in need, and I know what it is to have plenty. I have learned the secret of being content in any and every situation, whether well fed or hungry, whether living in plenty or in want. I can do all this through Him who gives me strength." In the show, there was a scene where a group of women and children were about to sit down to eat a meal together. They all joined hands and prayed, thanking God for their food. The undercover millionaire joined in too. I know what it was to have plenty. And I know what it is to have little. I've been on the giving and receiving side. And I can tell you that it's more fun to give. Receiving can be very humbling. This past week, I've been writing about vision and perspective. Open my eyes Lord! May we see past the outward appearances and into the hearts of people. May we ask God to truly open our eyes. May we be obedient when we are given an opportunity to help and not make excuses. I hope that TV shows like The Secret Millionaire will open people's eyes to the needs in their own communities and stimulate them to take action. I'm linking up with Charlotte and Ginger for Spiritual Sundays. I also saw that show...it was a repeat...but it delivered the message and I was so happy I watched it again. Thanks for sharing. I didn't see the show, but I think that's fantastic. We sure need more shows like this. Oh, I love that show and usually end up tears while I am watching it. It is so refreshing to me and as you said, usually always a good reminder. Debbie, all of our circumstances can change in a heart beat and I hope that if mine ever do that I will handle it with as much grace as you have and will be a testimony through it. You are such inspiration! Blessings my friend for a beautiful week! We saw part of this last night also...I was blessed beyond words. The part that got me the most was when the young man took his own shoes off and gave them to the older homeless man. For weeks God has been leading me through scriptures on the poor..even this morning. I too use to be able to give without restrictions...but now I am learning to receive and also how to take my little and give. I have noticed that giving out of my own need has a new impact on me...totally different from when I gave from abundance. Have an awesome week!!!!!! Enjoy your summer!